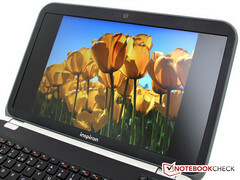 Dell has taken the wraps off some of its more popular Inspiron models in London during its 2012 Technology Camp show. In particular, the 14z will be Dell's newest ultrabook while the R models will be the multimedia all-rounders. Dell typically offers notebooks at more down to earth prices compared to much of the competition and its latest releases seem to continue that trend. As part of Dell's newest product lineup, the Inspiron series will see updates to the 13z, 14z (shown), 15R and 17R. The latter two will even have "Special Edition" SE models. First off, the Inspiron 13z will be the smaller member of the Inspiron family with red, pink and silver color options and switchable lids. The notebook is expected to weigh 1.73 kg (3.81 pounds) with a thickness of 20.8 mm (0.81 inches) and will run on Intel's ULV CPUs for a theoretical battery life of up 7.5 hours. Next up is the Inspiron 14z ultrabook which, despite the name, is actually a bit thicker than most ultrabooks currently in the market. Nonetheless, it still satisfies the Intel size prerequisites and will come in at just under 1.87 kg (4.1 pounds) with a thickness of 21 mm (0.83 inches). The 14z will also be one of the first ultrabooks (the other being the Acer Aspire Ultra M3) to include both an optical drive and discrete Nvidia Kepler graphics. In this case, the Dell model can be equipped with a GeForce GT 620M to power the 1366x768 resolution display. The 14z gives off a high-end aluminum chassis look, but a closer inspection will quickly reveal its cheaper plastic build quality for the base with no removable cover. Still, the aluminum lid seemed taut at first glance and the sound from the single subwoofer seemed impressive for its size. Exactly what configuration options will be available are still a mystery. With regards to the R series, the Inspiron 15R and Inspiron 17R will be coming standard with Waves MaxxAudio 3, but users will also be able configure the system with up to 1TB of storage and a choice between Sandy Bridge or Ivy Bridge CPUs. The 15R and 17R will begin at 500 Euro ($622 USD) and 550 Euro ($684 USD), respectively, and include switchable lids. Those who are willing to spend a couple hundred more can opt for the Special Edition models of the 15R and 17R for 750 Euro ($933 USD) and 900 Euro ($1120 USD), respectively. In addition to the reinforced aluminum chassis, Special Edition owners will also be getting quad-core IVB CPUs and 2GB Radeon HD 7730M graphics on the 15R SE or 2GB GeForce GT 650M graphics on the 17R SE. While the new series is indeed quite compact, we couldn't help but notice that much of it is mainly plastic. The SE notebooks do look and feel better and are more chic, but the colored borders will be either a hit or miss design choice. What's clear, however, is that the 14z will be positioned as an affordable ultrabook at only a starting price of 700 Euro ($871 USD), which may explain the plastic shell. In principle, Dell will soon be offering updated notebooks for both the entry-level ultrabook and multimedia segments with these upcoming Inspiron Z and R series.